The files in the screenshots of your home folder are actually located under the public_html folder under my home folder. I did not have a /refer folder under my public_html folder. I did not have post or page xml files anywhere on my WP account. I did include an entry in the robots.txt file I created to disallow crawling my sandbox site. I’m not sure that’s necessary since I’ve already selected the option in WP telling crawlers not to crawl my sandbox site, but I don’t think it will hurt to have the entry. Allow: /wp-admin/admin-ajax.php <– This is my robot.txt code but im confuse why my /wp-admin is index? How to no index it? I am trying to optimise robots for my website using Yoast. However Tools in Yoast does not have the option for ‘File Editor’. May you please advise how this can be addressed. Could it be that I am on a free edition of Yoast? The free version of Yoast still has the option, your installation may be disallowing file editing in which case you would likely need to use the FTP method. I really find this article helpful because I really don’t know much on how robot.txt works but now I do. pls what I don’t understand is how do I find the best format of robot.txt to use on my site (I mean one that works generally)? I noticed lots of big blogs I check ranking high on search engine uses different robot.txt format..
Having a sitemap and allowing the areas that need to be allowed is the most important part. The disallow part will vary based on each site. We shared a sample in our blog post, and that should be good for most WordPress sites. Please see the section regarding the ideal robots.txt file. It depends on your own requirements. Most bloggers exclude WordPress admin and plugin folders from the crawl. now I understand. I guess I’ll start with the general format for now. 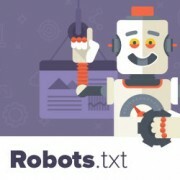 Well written article, I recommend the users to do sitemap before creating and enabling their ROBOTS text it will help your site to crawl faster and indexed easily. I would like to stop the search engines from indexing my archives during their crawl. I keep getting the error message below on google webmaster. I am basically stuck. 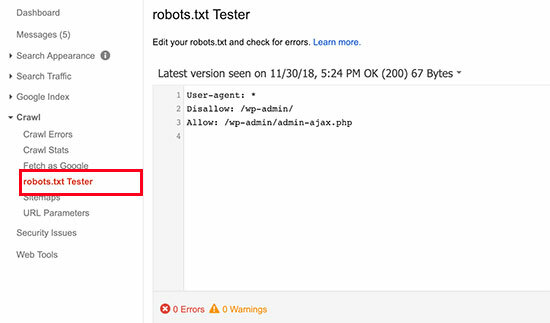 A few things that were not clear to me on this tutorial is where do I find my site’s root files, how do you determine if you already have a “robots.txt” and how do you edit it? 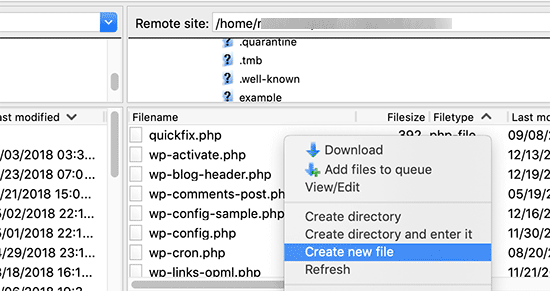 Your site’s root folder is the one that contains folders like wp-admin, wp-includes, wp-content, etc. It also contains files like wp-config.php, wp-cron.php, wp-blogheader.php, etc. 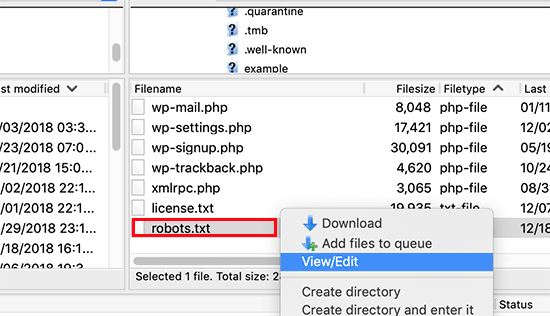 If you cannot see a robots.txt file in this folder, then you don’t have one. You can go a head and create a new one. Thank you for your response. I have looked everywhere and can’t seem to locate these root files as you describe. Is there a path directory I can take that leads to this folder. Like it is under Settings, etc? I had a decent web traffic to my website. Suddenly dropped to zero in the month of May. Till now I have been facing the issue. Please help me to recover my website. There is all list of product in sitemap.xml file. Do I Have To Create Product-sitemap.xml separately? and submit to google or bing again ? I have a problem on robots.txt file setting. Only one robots.txt is showing for all websites. Please help me to show separate robots.txt file of all websites. I have all separate robots.txt file of all individual website. But only one robots.txt file is showing in browser for all websites. in the beginner Robots.txt example? I do not understand the implications of this line. Is this important for the beginner? You have explained the other two Disallowed ones. This example was from WPBeginner’s robots.txt file. At WPBeginner we use ThirstyAffiliates to manage affiliate links and cloak URLs. Those URLs have /refer/ in them, that’s why we block them in our robots.txt file. How can I put all tags/mydomain.Com in nofollow? In robots.txt to concentrate the link Juice? Thanks. This is because all CSS stylesheets associated with Plugins are disallowed by the default robots.txt. I understand good reasons why I shouldn’t just make this allowable, but what would be an alternative as I would suspect the Google algorithms are marking down the site for not seeing these. How, can i solve this issue? Seems like someone accidentally changed your site’s privacy settings. Go to Settings » Reading page and scroll down to ‘Search engine visibility’ section. Make sure that the box next to is unchecked. let me know is that okey ? or should i use any other ? I want to know, does it a good idea to block (disallow) “/wp-content/plugins/” in robots.tx? Every time i remove a plugin it shows 404 error in some pages of that plugin. I loved this explanation. As a beginner I was very confused about robot.txt file and its uses. But now I know what is its purpose. in some robot.txt file index.php has been disallowed. Can you explain why ? is it a good practice. Thanks for passing by this precious info. Network unreachable: robots.txt unreachableWe were unable to crawl your Sitemap because we found a robots.txt file at the root of your site but were unable to download it. Please ensure that it is accessible or remove it completely. Because you are aware that google will index all your uploads pages as public URLs right? And then you will get slapped with errors for the page itself. Is there something I am missing here? Overall, its the actual pages that google crawls to generate image maps, NOT the uploads folders. Then you would have a problem of all the smaller image sizes, and other images that are for UI will also get indexed. If i’m incorrect, please explain this to me so I can understand your angle here. My blog url not indexing do i need to change my robots.txt? I am not sure what’s the problem but my robots.txt has two versions. Anybody, please help! Let me know what can be the possible cause and how to correct it? Most likely, your web host allows your site to be accessed with both www and non-www urls. Try changing robots.txt using an FTP client. Then examine it from both URLs if you can see your changes on both URLs then this means its the same file. Thanks for the quick reply. I have already done that, but I am not able to see any change. Is there any other way to resolve it? Today i got this mail from Google “Googlebot cannot access CSS and JS files”…what can be the solution? Let me guess… You are using CDN services to import CSS and JS files. It may be possible that you have written wrong syntax in these file. I have a question about adding Sitemaps. How can I add Yahoo and Bing Sitemap to Robots file and WordPress Directory? Thanks for the elaborate outline of using the robots file. Does anyone know if Yahoo is using this robots.txt too, and does it obey the rules mentioned in the file? I ask this since I have a “Disallow” for a certain page in my file, but I do receive traffic coming from Yahoo on that page. Nothing from Google, as it should be. Thanks in advance. I understood it robots.txt file and use of robots file. What is the site map how do I create sitemap for my site. 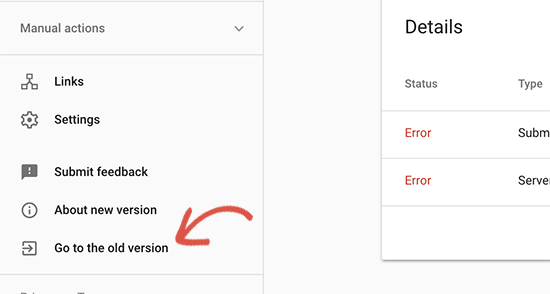 After reading Google’s documentation I’m under the impression that the directive to use in the robots.txt file is disallow which only tells the bots what they can and cannot crawl. It does not tell them what can and cannot be indexed. You need to use the noindex robots meta tag to have a page noindexed. 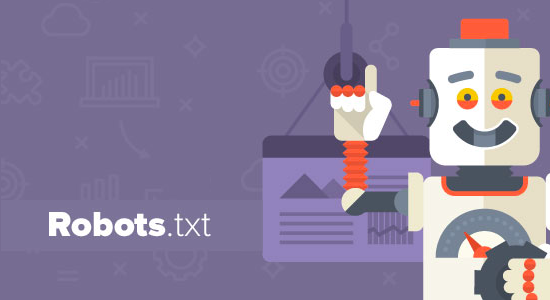 really good article for seo optimized robots.txt file. But I need you to give a tutorial on how to upload robots.txt file to server. As, being a beginner it seems to be a drastic problem to upload that file. By the way thanks to share such beneficial information. I know if you get wrong syntax when doing httacess it can take your site off line I am a newbie and need to block these annoying multiple urls from Russia, China, Ukraine etc. Thanks for those tips….robot txt files now amended! yay! why have to add Allow: !!! if I mention only which have to Disallow that enough. Don’t have to write code for Allow because Googlebot or Bingbot will crawl all other thing automatically. So why should I use Allow again? Since lacking the Robots.txt file doesn’t stop the site from being crawled, I find myself curious: Is there any sort of hard data on exactly how much having the file will improve SEO performance? I did a quick Google search, and didn’t see any sort of quantitative data on it. It’s about half a million articles saying, “Hey, this makes SEO better!” but I’d really like to know what we’re talking about here, even generally. Is this a 5% boost? 50? 500? Search engines don’t share such data. While not having a robots.txt file does not stop search engines from crawling or indexing a website. However, it is a recommended best practice. Thanks for taking the time to get back to me, I appreciate it! Good timing on this. I was trying to find this information just yesterday. The reason I was searching for it is that Google Webmaster tools was telling me that they could not properly crawl my site because I was blocking various resources needed for the proper rendering of the page. After I allowed this folder, the warning disappeared. You can safely ignore those warnings. It is only a warning if you actually had content there that you would want to get indexed. Sometimes users have restricted search bots and have forgotten about it. These warnings come in handy in those situations. I have a question that many people out there use static sitemap, and you know what they have wordpress site. Should we us static or sitemap genrated by worpress. NIce, i like the way Wpbeginner have, and with that rank in alexa, look to me is one of the best way to sue robots.txt..
what does my robots.txt file mean if it looks like this? It’s just saying that search engines should not index your wp-admin folder, wp-includes folder, and the xml-rpc file. Sometimes disallowing /wp-includes/ can block certain scripts for search engines specially if your site is using those scripts. This can hurt your SEO. The best thing to do is go to Google Webmaster Tools and fetch your website as a bot there. If everything loads fine, then you have nothing to worry about. If it says that scripts are blocked, then you may want to take out the wp-includes line. I see no logic in your idea about having a script within the includes directory that can be used by a crawn / robot .. and another, if there is an isolated case, it is better after specify the default wordpress allow this file you imagine that search engines use his scripts! after all, wordpress has certainly not by default an robots.txt anti serch engines!!! !